You are as inspirational as the puppy on the new bud lite commercial. Thanks for being my advocate. I have used the services of KL Creations for 15+ years. Kim Lay is a true professional who pays attention to detail and cares about her clients, She's also a lot of fun to work with too. Hire her! You will be glad you did. I have been very happy with the response I have gotten every time I have used KL Creations to design & send an e-flyer. I think it is a great way to draw attention and interest in property. Kim’s turn around time is fast and her designs are eye catching and clean. I couldn't be happier with the response I have gotten! Thank you Kim! Kim is innovative, creative, dependable and cheerful. She is as helpful as a good friend and very thoughtful regarding my time and real estate needs as well as personal catering services. I have always highly recommended her. I have been using Kim for about 17 years for marketing my business in Real Estate. Kim has always been very creative and on top of the most innovative marketing ideas in keeping you in touch with your sphere or farming area. Always on time when I need it! Very reliable & professional. 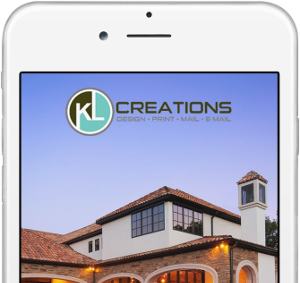 KL Creations has done a wonderful job of marketing mailers and E-flyers and other services for me for many years. I am so impressed with Kim's creativity and talent! I highly recommend KL Creations. Kim consistently does a great job on anything I ask her to do! Most of the time it is in short notice and she always does it with a smile! She is professional and creative and I am glad she works for me! Kim is wonderful to work with. She is always very attentive to our needs & does a great job! You will not go wrong using her talents to help you look good to your clients. Kim is great to work with! She's always on time with all her work and very reliable. I would definitely continue to work with her on all my listing announcements as well as marketing. I highly recommend her and her services! Kim has been the exclusive designer and provider of all my Marketing materials since the early days of her business. Her custom designed campaigns are the foundation of my exclusive repeat and referral mortgage business. Kim’s creations Keeps my multi-million dollar monthly volume on auto-pilot! I have been very happy with KL Creations. They have been very responsive to my sometimes last minute needs. I love the creativity they put into my fliers. Most importantly I like the results I have gotten from using them. Kim's e-flyers offer quick and reasonably priced property promotions. I have been using Kim's email advertising services for several years and can say that her service has been top notch, professional and courteous. I find it much easier to work with Kim, rather than some online service located who knows where. I've also had a very good response from her service, which greatly increased my showings. Below is an alphabetical list of all services offered by KL Creations! ...if you can dream it, we can design it!